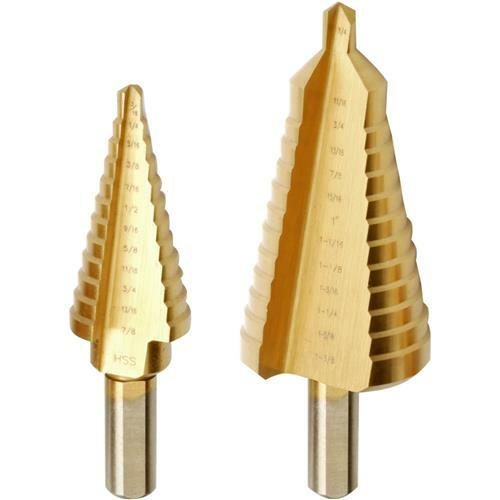 These step drills are designed to incrementally drill through sheet metal and thin stock until reaching the desired hole size. Three step drills (H8196) cover hole sizes from 1/8" to 1/2" in 1/32" increments, 3/16" to 1/2" in 1/16" increments and 1/4" to 3/4" in 1/16” increments. Two step drills (H8197) cover hole sizes from 3/16" to 1-3/8" in 1/16" increments. No-slip shanks fit 3/8" chucks. Titanium nitride coated for long life. 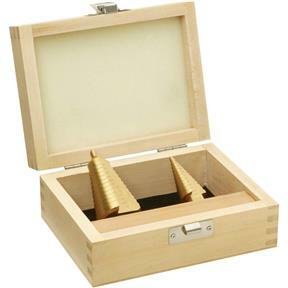 Includes wooden storage case.